Alrighty! We're officially one-third of the way through my 100 Learnings in 100 Days experiment. To celebrate, I'm going to cheat a little. This was something of a learning for me, but really more of a way to learn. Like the first best learning tool/investment you'll ever buy, this is a way to boost your learning because it's strengthens the foundations of your craft. It's your inspiration book. There are really two types. Flash or Fresnel above and to camera right; ambient fill. Fairly "un-posed." 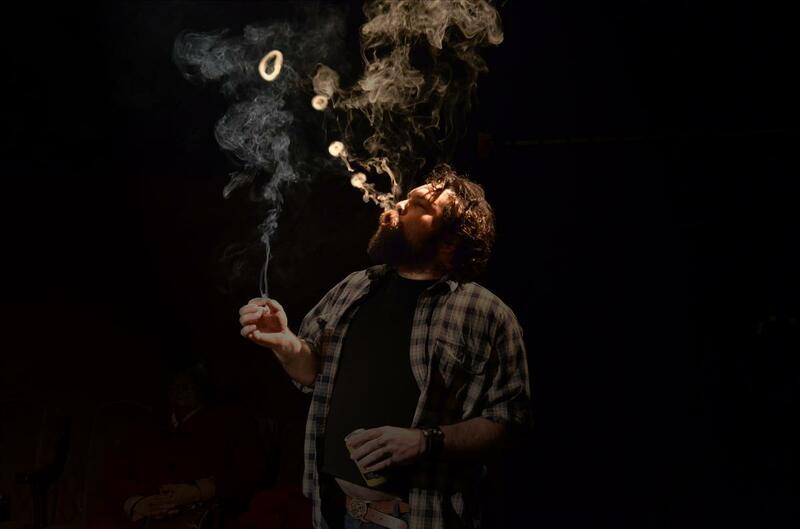 Face and smoke rings work on the diagonal, bringing focus to the subject. Arms at angles but not 90 degree. Open the eyes further; dodge out the floating hands in the background; have light spill onto the back of his shoulders. Mostly I miss the eyes. Each image will have the deconstruction beneath it. That's the first type of inspiration book. The second type, which I use regularly, is a set of images I've found (through google, other photographers websites, blogs, etc.) that inspire me as examples of what I could be putting to use in my current work. These may include interesting poses, lighting, angles, environmental portraits, examples of theory put to spectacular use. I put these in a folder and transfer it to my phone so I can have them at my fingertips. This group of images is ever-changing. I'll remove them after I've tried something similar or if I become bored with the image. I add new images constantly as I find them. When I book a shoot, I'll often go back and look through these images for ideas I can put to use. I ran across a tip the other day that I thought was interesting. It hard to remember the different poses you thought up while in the midst of a session. You may not want to refer to your notebook (I often write my ideas down), especially if you're feeling nervous. Another option is to take a picture of them with your camera, so you can check them during the shoot without being noticed. To do it effectively, you want to format or delete your card, then take pictures of the poses on your computer screen. That way, your cheat sheet will always be the next image on your camera during the session. You won't have to hunt for them.